When I was younger I’d sit down in front of the TV for entire days sometimes, watching TV or playing Nintendo. I noticed if I did it for around six hours or more I’d feel particularly bad. Despite knowing this from experience, I have to say that I’m still a bit shocked at the data that’s come out about just how bad sitting down is for you. You could say that the obesity epidemic in Western countries (Australia is the 6th fattest country, America is first, you can see the obesity ranking statistics here) is caused not just by the amount of processed, fatty, salty, sugary foods available in extra large portions, but also because we sit down all day. That’s a dangerous combination. Why? Because you put all this junk into your body, then by sitting down for long periods you switch your body off from doing anything with it. 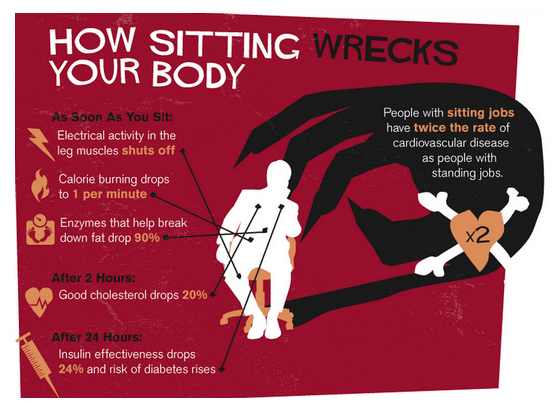 The two pictures above are from an infographic that contains confronting data about how sitting down for long periods is one of the most dangerous changes brought about by modern human life. Check out the full infographic from medicalbillingandcoding.org for more scary data and some suggestions on how to reduce your risk. I can’t recall where I first saw the idea of using a desk that you stand up at, it was probably a blogger who made the switch and wrote about it, but I do remember who finally swayed me to make the change myself. I was studying Eben Pagan’s “Wake Up Productive” productivity course. During one of the modules Eben talked about stand up desks and why they are more effective. Shortly after this I went down to Ikea and bought myself my first stand up table. I have used it ever since. Don’t You Get Tired Standing Up All Day? People who have not used a stand up desk before often wonder how someone can stand at a desk for eight hours a day to do work. Of course if I was standing up for eight hours straight, then yes I would get tired. These people are coming from the frame of reference of the full time employee, where it’s natural and expected that you stay at your desk for the majority of your time at work. As an independent entrepreneur, I have the wonderful freedom of structuring my work day how I like. This is actually a very important point when it comes to a stand up desk, because spending more than two hours in a row at my desk will tire your out. A quick aside – one of the other concepts I picked up from Eben, who I believe learned it from Tony Schwartz, is the concept of the Ultradian Rhythm. The descriptive term ultradian is used in sleep research in reference to the 90–120 minute cycling of the sleep stages during human sleep. The body has two hour rhythms of energy flow, so it makes sense to work in harmony with these cycles. Even before I heard of the Ultradian Rhythm I have always worked in roughly two hour blocks. Actually, it’s more accurate to say I “live” in two-hour blocks. I generally get hungry two hours after last eating. I tend to get bored after two hours of doing the same thing. I can exercise for two hours before I completely tire out. I like to socialise for two hours before I want to do something else. I like living life in short blocks, with rapid change of format. This is what I call balance. The Ultradian Rhythm just happens to back this up from a physiological standpoint. As an entrepreneur who has the freedom to work in harmony with my two-hour cycles, I never have to work for eight hours at my stand up desk. I work for one or two hours at a time, take breaks, walk off to cook food, sit on the couch, listen to music, have a nap – I mix it up every day. Most people can’t do this at their work place, but since you’re likely an entrepreneur if you read this blog, you have more freedom in your life, or are at least working towards it. It’s because of this that you are the perfect candidate for a stand up desk. Even if you have a full time job, given the data on the risks with sitting down, now is a good time to think about convincing whomever you need to about having stand up desks available at work, or at the very least, changing how you work so you don’t sit down for long uninterrupted periods. I used to have a sore back and shoulders on a regular basis, especially during the late 90s and early 2000s, when I was just starting online. I’m pretty confident it was because I’d spend 10+ hours in a chair, staring at a screen, hunched over. I pushed my body because my mind wanted to keep working. It loves the feeling of being productive, even to the detriment of the body. The only time I sit down for long periods is when I head to cafes to write or when watching a movie or tv show. 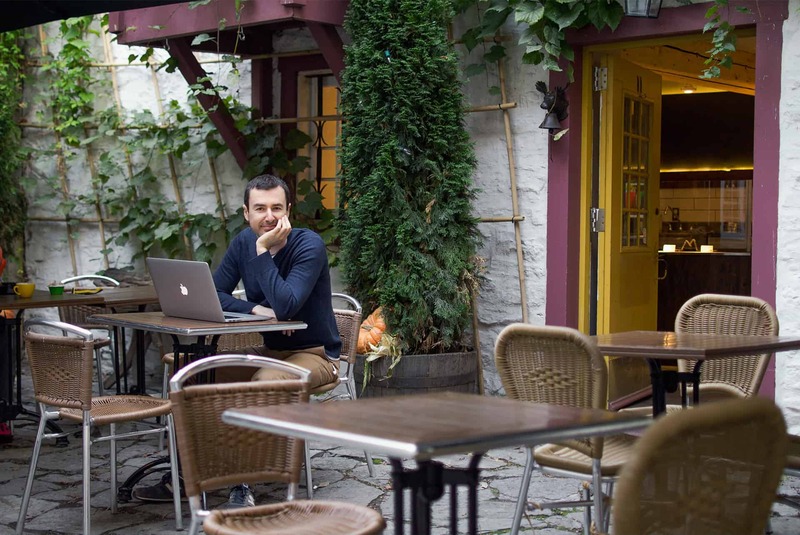 I like the environment of a cafe when focused only on writing, but of course I won’t spend longer than two hours doing it, so it fits the usual rhythm. Back when I used to work in a chair at a desk, I often found myself “trapped”. I’d get so lazy that I could spend hours staring at the screen, often doing no productive work. The world wide web is a great procrastination tool after all. These are some of the health benefits from a stand up desk, which in turn will make you more productive when it comes to work output. If your body is kept in better condition, then naturally you can produce more without tiring out. It’s win-win for your health and your business. The image to the right is my home office stand up desk. It’s nothing fancy, just an Ikea table top (VIKA AMON) and legs (mine are similar to VIKA KAJ), and some shoeboxes to prop up my monitor (30in Apple Cinema Display). My Macbook pro 13in retina plugs into the monitor and I have Altec Lansing speakers and a sub-woofer for music. The microphone you can see in the picture is a Snowball by Blue, which I use for podcast interviews and voice-only audio recordings. Oh, and let’s not forget the trusty yoga mat to stand on. This is really important, make sure you have something cushioning your feet. Make sure you watch my youtube video about my stand up desk for more footage of my desk at home. 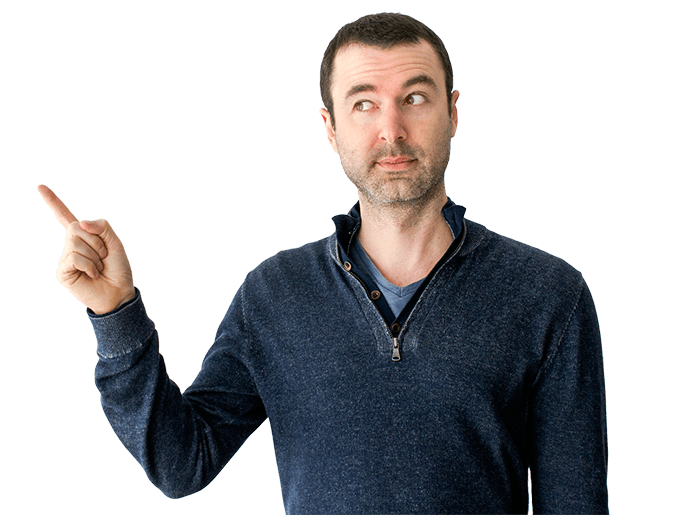 The video also includes further details about why I made the change to a stand up desk, what table top and legs you can purchase from Ikea to set up your own stand up desk for under $100, and some shots of my current stand up desk set up. Watch to the end of the video and you will find two funny outtakes from making the video. I hope that’s more than enough information to get you started. I’d like to thank my french friend, Alexis from Nouvelomme.fr (New Man), who had a great post on stand up desks, otherwise known as “travailler-debout”. I may have stolen a few of his pictures for this blog post. Would You Like To Triple Your Productivity? I hope this blog post has inspired you to consider a stand-up desk for your office, or at least keeps you from sitting down for too long. Only sitting is really not an option. Awesome, informative post! A co-worker and I just started this at work, and so far I love it. It isn’t 100% setup the way that I want it, because currently the desk is about 6 inches too far down, but that will be corrected next week, and I’m excited for that. And here is a picture of it! Great idea-think i am ok now-but nice to know for the future!. Sitting does my back no good. Have a great day! I actually work at a job where I stand all day. That includes any work on the computer as well. It was a bit to get used to, but once I did, I didn’t have the same problems as people who sat all day. We just switched to iPads so I’m curious how that will change things. 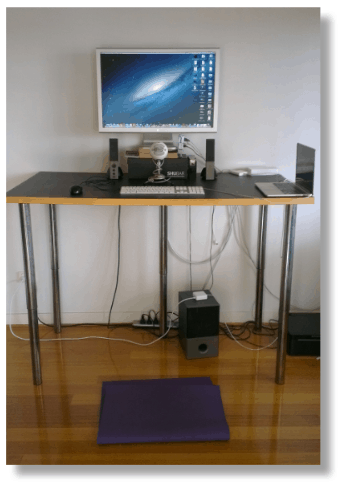 This is awesome, I think I’m gonna design my own stand up desk too.. good info and nice video too..
A great post, Yaro! I’ve been wanting to set up a stand desk for a long time but not yet. Although I still don’t use it as much as I hoped to and still plan to (my hope was/is to use it for several hours a day :)), I do use it whenever I watch movies, which is several times a week (I don’t have TV, so watch movies on my MacBook Pro instead, so I just place my laptop on the FitDesk). What a great idea, thank you for sharing Olga. Yaro, a very helpful post, thanks. Excellent in depth and well-thought-out article! The dangers of chronic sitting and the poor postural habits that accompany it are becoming well-documented by this point. I think the idea of standing while working with computers is the single best step towards healthy living these days. Just the low-level activity of standing, shifting your weight, walking about, and other subtle movements are so important for the intrinsic muscles of the spine, the proper function of the lymph system, the venous return to the heart, and other body systems. Great article. Thanks for sharing. Check out http://www.johnson-family-chiropractic.com/1/post/2012/12/standing-while-you-work.html for some of my other thoughts on the subject. This blog couldn’t have happened at a more opportune time. My blog is about a lot of things for the woman over 50 and health is a huge part of my message. So, in my research, I have run into so many blogs about the dangers of sitting for long periods of time. It has become a large concern for me because there have been times when I’ve been involved in researching and writing an article and haven’t moved from my chair in 8-9 hours. Am getting started on the stand-up desk immediately. Thanks, so many time you seem to be reading my mind about what to write on your blog. Thanks for all the help. I’m shocked by some of those stats, you’ve left me seriously considering getting a stand up too! I have been thinking of adding a stand up desk for years. Maybe to dip my toe in the water, I can just get a stand up table, and use it when I work on the laptop. I switch back and forth from the desktop to the laptop every day. So I can start by doing sort of a half and half. Thank you very much for the article. I’m writting you this comment from my… home made stand-up desk ! Nice work Ling-en, looks really good! I have a bar height table from Ikea that would work perfectly for a stand-up desk. Good suggestion about yoga mat for your feet too. I’m lucky. I had an ergonomic assessment of my work station about 10 years ago and my company has provided me with a wonderful, fully adjustable standing desk since then. It’s interesting…they were once an oddity (I used to get LOTS of questions) and now they are more common and highly prized. I have a standard desk for those tasks that need that kind of attention…like I said, I’m lucky to work for a company that cares! Nice post. I have actually worked at a research center of one Oil and Gas company here in Germany, which had these stand-up desks. Actually one could switch , to make it a sit-down or stand-p desk with some electro-mechanical system. you just hit that button on the side. It was really cool. I wasn’t aware of dangers of sitting that you did mention in this blog. But I found that more productive, you would stand up and never loose the focus. Focus on work is important in presence of World Wide Web. I agree. When you’re sitting down, you’re more likely to do brainless activities such as browsing the web, emails and wasting time unconsciously. When you’re standing up, you’re constantly thinking about what you’re doing – you’re much less likely to let your mind wander. This is what I’ve found the biggest benefit of a stand up desk. In my work office I use this one: http://bit.ly/122L1EP it lets me switch between standing and sitting, and I like to have both options. If one has a bad back to start with, is a standing posture better or worse for the back? Haha wow Yaro, you hardly ever laugh when you do mistakes on video man! Anyway, I think the stand up desk has a really strong foundation and I have seen more and more people who are all about lifestyle and marketing going for these home made setups. I actually like working near my kitchen and I happen to have a place (it’s like a table but it’s not a table per se, I just don’t know the English word for it -a kitchen counter maybe?-) that is designed for having breakfast there and it happens to be at the perfect height so I think I’m going to take the laptop there and see how it feels for me. Thanks for the health improvement and reminder man, all the best! Yaro, I’m glad to see standing desks are starting to catch on and more and more people are concerned about the health effects of sedentary lifestyles. Even better, you provided an alternative to the all too common $500 standing desks or $2,000 treadmill desks, which are outrageous. I am debuting a product at CES next week in Las Vegas that is in line with standing desks and can be used with any laptop or tablet device and allows you to switch from sitting and standing, using the same device. I work from home too and my productivity was killed by always being uncomfortable, eye strain or just not wanting to sit anymore, so I’m setting out to change that. Hopefully more people take this advice and if they don’t invest in a standing desk, hopefully they will realize how much of a difference getting up and walking 5 minutes each hour can make. We shouldn’t sacrifice our health to work and our work shouldn’t suffer because of our productivity. A stand up desk is a good idea, given the recent data on how sitting all day affects health and life span. But I do something instead. Every hour my watch chimes, and like a Pavlovian dog, I push away from the desk and do a prescribed set of things, such as squats, push ups and specific stretches to counteract the slumping forward mode that sitting involves. I’ve been considering this for a while too. But since I have limited space, and am at my desk all day, there’s no room for a sit down desk plus a stand up desk. I was wondering if you knew of a solution similar to what Imran mentioned, for want of a better term: a converter that allows you to work sitting down and then boost the monitor and keyboard to allow work standing up. Then when you are tired, to revert to a sitting position. the Vika Kaj legs are not long enough for us taller guys. And I am not that tall. Only 183 cm (about 6 foot). However, the VIKA BYSKE legs go up to 42-1/8 inches and when combined with a 1-3/8 desk gives a max height of 43-1/2 inches. Much better as my b.b. is 42-1/2 from floor. I am really considering switching to a stand up desk. Mainly, it is my back that suffers from sitting down all day. I still keep of a period of exercise or sport during the day. Although I train a lot, I have to admit that I feel uncomfortable sitting down for long periods of time. I have some doubts if standing up during many hours will be the best. It seems better and more natural standing up than sitting down. What is even more natural is walking (like the treadmill setup). Sometimes, I like to sit down and relax when working on my computer. Furthermore, in my work, I perform better sometimes sitting down when I need more concentration. However, it is never many hours in a row. I believe the real solution comes from varying our position. I am going to try different setups and adopt a new lifestyle. I wish I could have a desktop with both positions: stand up and the chair. Sebastian, my set-up with a “coffee table” on top of my regular desk allows me to slide the computer back so that I can sit at the regular desk if I wish. I would be easier to have a high chair to sit on for those times I do not wish to stand. My chiropractor also suggested something to put one of my feet on to adjust the alignment of my back. I have to try that. A padded mat to stand on certainly helps. I also take little walks around my room when I have sent an email, etc, so that I get some variation in back position. I am a woodcarver. My kind of work requires me to be standing most of the time. A couple of years ago I experienced some kind of pain on my foot. I learned it was called plantar fasciitis which is an inflammation of the arch tendon on the foot. My point is working 8 hours a day on a standing position is not conducive to health. I would rather use a kneeling chair on my office instead of the regular office chair. I have a kitchen island that I often use as a desk, but now I will do it even more! The thing I like about your posts is that a always so well researched and full of practical advice. Fascinating stuff, and you’ve just given me an idea Yaro. Years ago when I first started my offline consulting business I used to do a lot of manual design and drafting and would stand at my drafting table. This would be for most of the day (but not every day of the week!) and it was what I preferred to do. It just felt more comfortable, but I didn’t know why. Well, guess what? I still have that same drafting table, hasn’t been used in years because I moved to CAD. This table has adjustable legs to suit a person’s height, and it also has a large table area to place a lot of stuff on. I’m going down to the shed right now to dust it off. Hint for readers – look around for cast-off drafting/drawing tables. You could pick one up for a song! What we really need, and now that Large LCD touch screens and 3D tracking cameras (like the Xbox kinect) are getting cheaper in may be possible soon, Is a large screen NO MORE mouse NO MORE Key boards and computer interaction from anywhere in the room. and free you from the desk completely. If a cheap game console can track your movements into computer input and Siri on a iPhone can take voice commands and eye movement recognition devices it is time we merge all these technologies into truly modern workstations that throw away the old writing desk once and for all. Sorry everyone that learned to touch type but I want to make that skill obsolete how about transferring words and design to screen as fast as you can think not just tap keys no need for a ergonomic mouse (believe me I have tried them all from tables to track balls to track pads) ANY repetitive motion causes stress on you no matter HOW ergonomic the device used. Sitting is bad yes but so is standing in fact the reason we invented chairs is because standing all day is tiring also. AND YES at the moment anyway there are still people that have to spend hours doing one thing all day so standing or sitting they will still have Repetitive stress related injuries and just standing up vs sitting is NOT going to solve obesity problems I know of people that have never had a desk job in their life that are obesely overweight they held what would normally be called very active jobs construction workers even with huge beer guts it is NOT just what you do at work that is making you unhealthy. A wonderful post. I know your blog for the past 4 years and I believe that this is one of the most useful posts ever. I didn’t expect it was that dangerous to work sitted down for a long time, damn! Thanks for these explanations, statistics and videos! I will think about it very seriously in this month and see what I can do in my home. BTW I will share it on my Twitter. I was curious what would be the content of the article when I clicked in the email link – but I am glad I did. Just elevated my laptop position by putting two old desktop computers flat on the desk and am standing as I write this. I’ve been doing my marathon training for last 3 months and this is just right in time. Hopefully this is something I can have all my 20 team mates practising in near future. Wow! 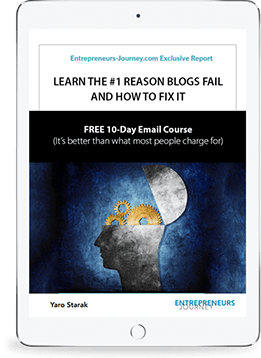 Yaro, talk about making revolutionary changes to productivity and health! Intuitively, it makes perfect sense as your body would be more fully “awake” and engaged in the tasks at hand. I guess, this is taking the phrase “think on your feet/toes” to a whole new level. Great informative post as usual! How tall is the table you are using? Happy New Year’s and thank you for this informative and relevant post. I’m an incomplete paraplegic from a motorcycle accident, and while I was in a wheelchair and a complete paraplegic, I’m only partially paralyzed now, and I can walk and stand (not run :). But I cannot stand while working due to endurance strength and balance. So I’ve been doing something which may also work for other people who cannot use a standing desk for any reason. I use a timer in my browser that I set for 20 minutes. Each time the timer goes off I stand up and I do 20 partial squats and some simple stretches and then get back to work. I originally did this 20 minute timer thing because it keeps me on target with three 20 minute blocks every hour and it reminds me that time is going by! Get more work done! Then near the end of last year I realized, ” Aha, my circulation is bad–so I’ll do ’20 at 20′,” and so I pop up (sometimes not happy about it because I like to work and don’t want to stop), and I do the light exercises. From your news above I can see this will help me–and it’s better than sitting all day! BTW In the past I owned a Herman Miller Aeron chair, and while I now know it’s not good to sitt for extended periods of time–if you have to sit for many hours each day–the Herman Miller Aeron IS THE CHAIR. being in IT and web dev since 1996–I’ve done TOO many hours in desk chairs. With the Aeron you do not feel like you’ve been sitting. I’ve been thinking about this for a while but now you’ve pointed out the health risks in detail I think I really need to make the change. And, lucky me, I already have a suitable Ikea desk so I just need to get new legs! Another point worth considering might be the shoes you wear at a stand up desk. I choose comfort and support over fashion these days but many women still wear ridiculous heels at work. I don’t imagine it would be a god idea to work at a stand up desk in those! Long-time reader of your ezine here. This stand up deak is a GREAT idea – might work with the old architect/draftsman tables as well. Warmest regards and rock your day! Or, try the treadmill desk! It makes me feel a little better about my own bloopers knowing that someone as seasoned as you still makes mistakes! The company I work for is slowly introducing the standing work stations to the office, which is great, but I didn’t even think about how much time I spend in the home office after work. I’m looking forward to applying something like the solution you’ve suggested for my home setup. easier for blood to clot in certain parts of the body. Here’s a great story you may enjoy about standing. and stood for 8 hrs. a day. Enjoy the new year Yaro! Excellent info, thanks so much. Your videos are great, do you shoot it with iphone? I use my old VADO HD handheld camera at the moment, sometimes the webcam on my mac too. I must say the idea of a stand-up desk is rather scary at first since it’s completely different from the sedentary lifestyle that most of us are having, not only at work, but also at the cinema, cafe talks, etc. But come to think about it, it’s just something we’re used to. So it can definitely be chagned. And improving our health is definitely a great reason to kickstart the new habit. Thanks Yaro. This info and suggestion is really great. A nice gift to start 2013. This is a great info and I will send the direct url to my subscribers too. I noticed of recent that I do have sore back often due to so much sitting down. After reading this blog post, I have decided to start standing up to do other things after 2hrs intervals. I’ve been standing for about 3 months now, but always looking for more ways to improve posture, energy levels and productivity. The Ultradian Rhythm stuff looks really interesting, I hadn’t heard of that before. I’ve been using the Pomodoro technique and switching position after every 4 pomodoros. – Wear MBT shoes. I get less aching in my feet now. – I mounted a TRX suspension trainer on the office, so I exercise on it in some of my breaks. It has made a big difference to my core stability. – I invested in a motorised desk frame and fitted it to my existing Ikea Galant top. I can now fine tune the height to whatever task i’m doing or what i’m sitting on. Great photos Matt, it’s amazing how many different ways people have set up home offices with stand up desks. I recently had a therapist who specializes in ergonomics come to my home office because I was suffering from some neck issues. One of the things she recommended right of the bat was that I get a standing desk. Well, I didn’t do it at the time, but I did do everything else she recommended and it made an amazing difference in how I feel at the end of every day. I guess it’s time to re look at the standing desk thing. I like your simple design. I’ve always been a big believer in not sitting still for too long but had never considered standing. Will look into it pronto. Thanks Yaro for this health saving and helping post! Over 90% of internet users especially mavericks are guilty of this long standing baby sitting on computer. Sorry Yaro, you lost all credibility when you said you use a Mac. Joking aside, this is an excellent idea. In our house though the space below the desk would be completely filled with something. Absolutely stupid in terms of Feng Shui I know but when your partner is a teacher it sort of takes over. Did you know Jason Fladelin has gone one further than this? Two further actually. First he’s got a dual screen set up. More than that though he’s put a treadmill below the desk. He runs it very slowly but it’s enough to keep the circulation going and also generate the endorphins that are required for creativity. No wonder Jason is one creative guy. We will be doing quite a bit of remodelling around the house this year (I’m told) so I wonder if I can get her to incorporate this idea into our home office. I purchased a “stand up desk” which is a platform that you can attach a monitor to with a small deck for writing. It collapses to the desk level or extends to accommodate work while standing. I paid nearly $500.00 for it and that was a complete waste of money. I wanted the advantage of sitting and standing, depending on my mood. It hadn’t occurred to me to purchase a tall chair that would allow me to sit at a standing desk when I did need a few minutes off my feet. Your solution is much more practical. Anyone want to buy a collapsible monitor mount-standing desk . . . cheap? I’m pleased to report that thanks to your post, I’ve made an incredible change right at the beginning of 2013: a stand-up desk. I bought it at IKEA: a no-frills table top and 4 legs (a bit expensive for me but ok). I’m still sitting while at work but when I’m back home, I’m standing these days. I feel a bit sore after a few days but overall it’s been okay. And I like it. And this standing position definitely encouraged me to walk around and take breaks more often. Well hello Yaro, I switched to a standing desk about 6 months ago and would never go back to a traditional sitting desk. As you highlight the ability to take an instant walk to compose your thoughts and then instantly return to work without having to re-position the chair and resettle yourself for work has been the best productivity bonus for me. I know Chris Kesser has done the same – stand-up desk complete with treadmill. It makes such a lot of sense. Our bodies were never designed to sit – squat yes, as that actually aligns the back, but sitting put a lot of pressure on our spines. Thanks Yaro. I spend more than 70 percentage of my day sitting either in a bus, watching tv, creating content for my blog or at work. I must say I am constantly having backaches. I really need to follow this approach. Thanks Yaro. There was a TV program on this last night and they echoed everything you’ve mentioned about blood fat levels rising and insulin processing being reduced. One of their tips was to move about at least once an hour, and to try and keep constant motion in your day. Walk up stairs instead of the lift or escalator, stand on the train/bar instead of sitting. And keep moving at home. Great advice, thanks. How does this work with a laptop? Place the laptop on a pile of books and plug in an external keyboard. That’s what I have done while traveling to still get the height, but the keyboard needs to be down at your elbows so you will have to use an external one. Thanks for this information. I have a follow up question about the table height. The Vika Kaj legs from IKEA say they are height adjustable 23 5/8-35 3/8″. The max height might be a little short for someone like me at 6’2″. How tall are you? I’m 182cm, so just on six foot IM. The legs could go higher still too, I guess it also depends how your body is proportioned, if you have short arms and long legs you might need a taller table. Having a desk the right height makes a big difference. I sometimes work on the kitchen counter which is about the same height as Vika Kaj legs will go and I can feel it in my neck and arms after a while. Standing desks ARE awesome, but what I’ve found to be even more awesome are adjustable height desks. Have you looked into one of these? I know the point is standing for more of the day, but the thing I really like about my adjustable height desk is that I can just push a button and it will move from standing to sitting– or any height really. Don’t get me wrong, I do stand for 90% of my day, but for those times when I do want a little sitting break, it’s really convenient. What do you do if you want to take a sit for a moment? Anyway, you can check out the desk I use here: http://www.NextDesks.com. There are tons of options out there though, this is just the one I’ve been using and really like so far. What a brilliant concept. I was a bit skeptical at first, but decided to give the idea a try. I build a 2.4 M by 600mm stand up desk and it is great. I realy live the way it has improved my attitude and and effectiveness to productivity. I sent Yaro a photo of my setup as I can’t see how to attach it to this comment. I just couldn’t put my finger on it, and as I was scrolling through your blog I thought, “hmmm”. a las’ I found a solution. I have a dresser at my perfect height level I put my laptop on and voila! I just started doing this by the time I wrote this post to tell you that this is some of THE best advice I’ve received to make myself more productive and easily move around without feeling ‘lazy’ to get up out of a sitting position for hours at a time. Plus, this will force me to get more done in less time before I grow weary standing and NEED to sit down or move for breaks. I really, really appreciate you sharing this. By the way, has any one else had their legs borderline fall asleep on them on a regular basis from sitting down all the time? I have had my stand up desk for over a year and I love it. But I disagree that you would get tired after standing for more than two hours. I work an 8 hour office job and I never sit unless I’m meeting in a colleague’s office. And I am nowhere near skinny. If I can do it, almost anyone can do it. You’d be amazed how fast your body gets used to the change. And beneath the padded wall, I have some amazing muscles in my thighs and calves. Anyway, thanks for the ergonomic schematic and awesome observations! I think that’s an interesting alternative, which offers several benefits. However, in the case of computer gaming, it’s a bit … undoable, because of the long time spent on the screen IMO. It’s great that someone explained so precisely the concept and its consequences. Thanks a lot. Standup desk is a great idea but job is a job you can’t ask your boss to arrange standup desk for 9 hours job in office. Agree sitting is killing. I’m way too short for most DIY options, plus they’re kind of a pain to set up and take down multiple times a day. If you want to try standing desks, my vote is for StorkStand. It’s collapsable and weighs four pounds, so you can take it back and forth with you pretty easily. Also it costs less than $200, which is awesome. The Kickstarter for it is at https://www.kickstarter.com/projects/889675794/storkstand-the-most-affordable-mobile-standing-des. Great post about your journey towards getting out of your chair; i hate sitting for very long, just as I hate standing in place for very long. I like to move around, and i find a standing setup encourages me to take more action and do less googling. I couldn’t agree with you more, Yaro. I am using the TaskMate Executive from Health Postures and it really helped me become more productive at work. It has helped me become more energized all throughout the duration of my shift. I am now more cautious of this ergonomics after I had a cervical injury couple of months ago. If I had known of this earlier, I would have suffered from a severe pain in my spine. But still thankful though that I am now healed because of the therapy and not because of the surgery. I would love to see standing desks become much more popular. 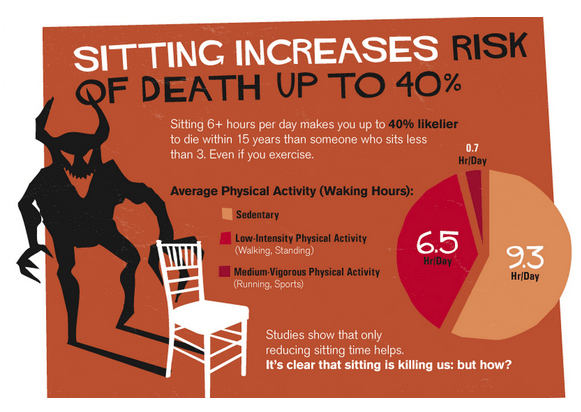 The health statistics regarding sitting for long periods of time are very frightening. Since most of us work at jobs that are very stationary in nature, a standing desk could be a great compromise for improving health. Three Days ago, the idea came to me to find a Desk to stand up and work on the Computer. Then I remembered I could use my Keyboard(for Music) Stand and something to lay across it like a Briefcase. This Morning, I started doing it, and I noticed that I move around more, but more importantly, I believe this will make me focus and work a little faster, because I can see it will hard to stand for unnecessary Hours!!! I also plan to exercise while I’m standing from time to time. 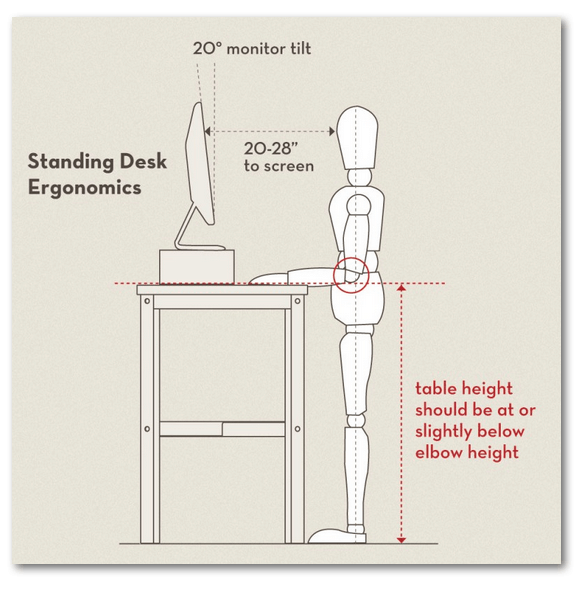 I have a first hand experience or effects of sitting for longer hours, you body just gets messed up, I’d suggest in investing in a high quality, ergonomic solution for your office. Awesome piece Yaro. Great information as well. Will be Getting one as soon as I can. I started doing this today. By accident actually. I moved my laptop to a tall set of draws in our bedroom whilst my partner mopped the floor. I was using the laptop like this for 15 minutes and couldn’t help but notice how nice it felt. So I continued. I Googled it to see if others stand up at the computer and came across this. I’m a programmer. I sit on my bed 10+ hours a day because it’s comfortable either programming, or reading. I’ve done this for a while and I know how bad it is. My leg muscles have decreased in size, I get tiered quickly, and I got very lazy. I stopped my personal projects because I just got lazy. It’s been a good 6 hours standing up. I love it. I’ve taken breaks … you physically can’t work that long standing up. I can’t anyway. I am keeping the laptop here. I find I’m now only using the computer to actually code, and I spend the rest of the time away from the computer actually planning whatever it is I’m building. I can’t afford to spend the rest of my life sitting at a computer, and I certainly don’t want to stop programming. This is perfect. Only problem I’ve found is sore feet. But my slippers fixed that. I might invest in some seriously comfortable foot ware. Or a thick yoga mat. I have always wanted one of these! Thanks for writing about it! With increasing stress in work life I think working while standing gives a little bit of relaxation . We have around 10 standing work bays at our office. Thanks for sharing this guide! I think I sit too for long time and I’ll have to work on it! I am definitely going to try one of those stand up desk. Thanks for this great post. Great article Yaro, After I read this post, immediately I stand up.. haha! Thank you for this information. It really helped me a lot! Keep doing this greate wrting! While I appreciate your innovative ideas, I still don’t comprehend how someone can work standing for eight hours. Thank you for sharing all these details to make people aware of the risks of sitting. Keep sharing such posts and shedding light on the unknown facts. I liked the images you have shared here. I hear you Jiya – I don’t think standing up for 8 hours makes sense either. I get a sore back from about 2-3 hours, so you do have to rest. If you work in an office, being able to standup then sit down is good. In my case, working at home, I work standing up like doing a podcast interview, or talking on zoom conferences, then I might sit down on my couch for lunch, then head to a coffee shop and sit down work. The key is movement, the body needs to be used.